Honestly, I don’t deal with morning sickness well at all. I’m not sure why I’m even posting about it, but there are a few things that have helped me ease my suffering and I thought I would share them here. Always consult with your doctor before introducing anything new to your diet if you are pregnant. I’ve been having a hard time drinking water. I love water, but my body wasn’t loving it back. I’m queasy and thirsty all day long and all water would manage to do is spread around my stomach acid and make me feel worse. I tried drinking flavored water, but anything artificially sweet made the feeling worse. Soda helped, but I wasn’t crazy about consuming so much sugar and calories, but what else was I going to do? Seltzer water with juice didn’t help. Juice straight up helped for about 5 minutes and then the sugar eventually made me feel sick. Cue in Coconut water. My housekeeper suggested it. She said the fresher the better. She was right. I went to my local ethnic foods store (and even Whole Foods) for fresh young coconuts. It helped. Alot. I wanted too buy several fresh coconuts, but they are bulky and won’t fit in my refrigerator, so I decided to try the canned stuff. It doesn’t help with the nausea as much as the fresh, but it still does the trick. Before I was pregnant, I preferred the Amy & Brian’s brand. It had a decent amount of sweetness without being overly sweet. 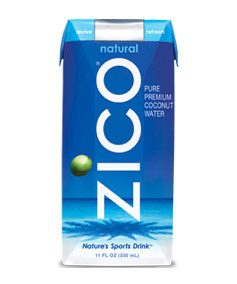 Now that I’m pregnant, it’s too sweet, I prefer the Zico brand. It is mildly sweet and great over ice. My guess is that they high potassium content of the coconut water helps counteract the nausea. Or maybe it’s all in my head. Very simple. Boil water and stick wedges of lemon in it. Let it sit for a couple of minutes. I don’t had an sweetener. I would eat this with a bit of brown rice, or crackers and it really seemed to helped even me out. I believe the B-vitamins in the fruit help, but also the added fat slowed down any sugar spikes that contributed to my nausea. If you are currently suffering from monring sickness. I hope these small little tips help you like they helped me.